It has been two long weeks since my opening week of fishing and I was gagging to get to the river. I was on the riverbank at 6am and due to the rain last night the water had coloured up, I couldn't go fish spotting as planned - I had to rely on swims I'd spotted them in before. I stayed about 2 hours longer than I had planned. But they were up for it - including one barbel which nailed the bait as I wound it in and one that swirled at it as it hit the water. A grand total of 15 barbel and 4 chub. No monsters, the best going 6lb 7oz (above), but the action was hectic. It didn't all go to plan - I lost 6 barbel to hook-pulls, two of them looked like bigger fish - can't really complain though. 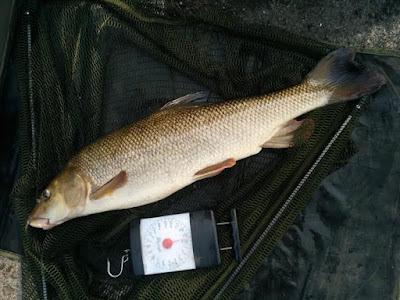 Barbel went 1lb, 5lb, 1lb, 3lb, 6lb 7oz, 4lb, 3lb, 2lb, 1lb, 3lb, 3½lb, 1lb, 4½lb, 1½lb and 1¾lb. 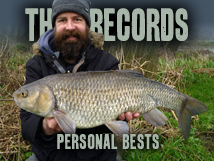 Total of 41lb 11oz for the records. Damn fine days fishing I'd say. Sometimes just getting a bunch of bites is as much fun as landing the bigger fish, I've had days where catching Jacks on nearly every cast is more fun than fishing all day for that one big shark. Yeah with limited time I'd rather be into a few fish than stalking a big one. Hopefully stumble across some bigger fish while I'm doing it (and hopefully they will stay on next time).